FMCA's first national "gathering" took place July 17, 18, and 19, 1964, on the grounds of Fort Ticonderoga in Ticonderoga, New York. A total of 106 member families attended this event, hailing from 20 states and the Canadian province of Quebec. In addition, representatives from Frank Motor Homes, Clark Equipment Co., Wolfe Coaches, Private Coach Corporation, Telaak Kustom Koach, and Boyertown Auto Body Works were on hand to display their company's products. The inaugural gathering began with a demonstration of the Centaur folding motor scooter in the morning and a get-acquainted meeting in the afternoon. Attendees occupied the evening hours by socializing and viewing movies of the Adirondack, New York, region. Chartered buses transported FMCAers to Lake George for swimming. Informational sessions dotted the schedule as well, including a discussion of CB radio led by Charlie Owens, F44, and Ray Fritz's talk about layouts and fittings for converting coaches. A meeting for coach owners interested in parking near the New York World's Fair also took place. FMCA's early conventions incorporated many activities still featured today -- and some no longer scheduled. For instance, during the association's fifth annual summer convention in Bowling Green, Kentucky, a Volkswagen Bug auto was raffled off. Convention-goers also participated in canoe races, folding bicycle races, and a zany hat contest. FMCA's first conventions were annual affairs, typically held each July. These gatherings grew steadily, topping 1,000 coaches at Essex Junction/Burlington, Vermont, at the ninth annual summer convention in July 1972. By 1976 conventions began to be held biannually; the first national winter gathering attracted 687 coaches in early March 1976 in Harlingen, Texas. For a two-year period -- 1989 and 1990 -- FMCA hosted three conventions each year. In July 1977, FMCA's Syracuse, New York, convention boasted 2,169 coaches, topping the 2,000 mark for the first time. The 3,000 mark was first surpassed in March 1985, during an unseasonably cold March convention in Tucson, Arizona. All records were again shattered in Las Cruces, New Mexico, in 1998, where the official count reached an incredible 7,258 coaches. Two years later, 7,422 coaches filled the Brunswick Naval Air Base in Maine, establishing the all-time coach count record that still stands today. 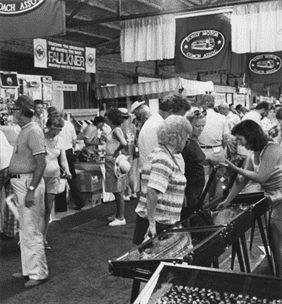 From the outset, FMCA was a family organization supported by motorhome-related companies. Although infinitely smaller than today's RV industry, a number of companies were already in business in those early days. FMCA commercial members have supported the association's conventions and rallies by exhibiting, sponsoring entertainment and coffee hour, providing door prizes (even a Foretravel coach in 1978), performing coach service, and donating the time of countless industry officials. From the beginning, the need was felt among industry representatives to unite as a collective body for the betterment of both coach owners and companies. In January 1966, the first meeting of the Manufacturer's Advisory Board took place in Cincinnati. Later, company officials served on the Industry Advisory Board. Today, the FMCA Commercial Council continues to meet three times yearly.